IMPORTANT: Which Size Do You Need? There are two sizes in this range but MOST lockers will take the smaller size 30mm. The 30mm has 3 dials and the 40mm with 4 dials. Some Cam Locks, as seen on the video below, require a larger padlock with the thicker 6-8mm shackle. 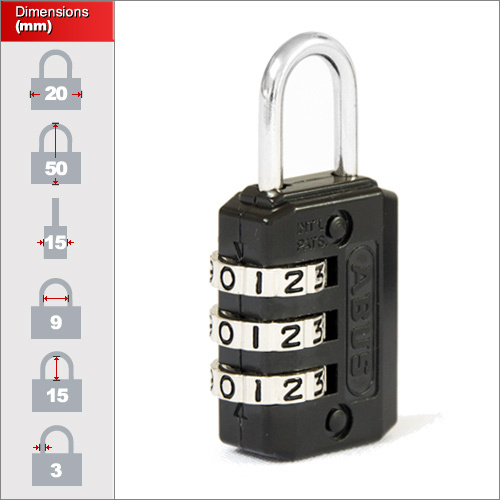 If you have this type of locking system you will have to opt for the larger 40mm size! If you're unsure then we have written a small guidence article on Cam Latches. 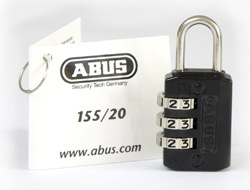 Nothing But Padlocks produces these in conjunction with ABUS specifically with School and Gyms lockers in mind. This is NOT a cheap import from the Far East. There are some copies flooding the market now but they will not contain the reliable ABUS mechanism as these do. ABUS is the most highly regarded manufacturer in the world and we wanted to offer a combination padlock that would be strong, reliable and withstand regularly usage. It was also highly important that the padlock was not susceptible to a common fault with some other combination padlocks whereby a specific technique of pulling the shackle can be used to discover the code. There are two sizes in this range. The 30mm with 3 dials and the 40mm with 4 dials. Many lockers will take either size and therefore it depends on what security level you want to achieve or if you can afford the larger type within your budget. However, some Cam Locks, as seen on the video below, require a larger padlock with the thicker 6-8mm shackle. If you have this type of locking system you will have to opt for the larger 40mm size! If you're unsure then we have written a small guidence article on Cam Latches. This padlock is ideal for lockers, money boxes, laptop bags, suitcases and travelling in general. A 3-digit code offers up to 1,000 variations.